A Swimming Pool with a surface area of 800sq.ft will lose about 499 gallons per inch. Multiply that by the number of inches the pool is losing per day, and you have yourself a large water loss which can potentially be thousands of gallons a day. In turn this can be more costly than the actual repair itself. More water will need to be added to the Pool along with more Chlorine and balancing chemicals which will result in loss of money. Example: Surface area x 0.0833x 7.5= water loss for 1inch of water to that specific pool. Swimming Pools are meant to be watertight, of course, but sealants will deteriorate, while other parts of your pool shift and settle, or just plain wear out. Pools can leak through any of the fittings or accessories, plumbing or even right through the shell. 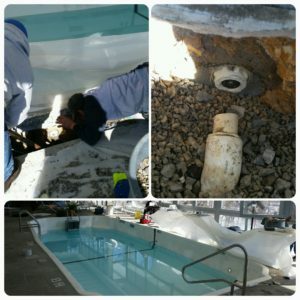 It is important to repair pool leaks, not only to save water, heat and chemicals, but also to prevent undermining pool structural components, and washing away fill dirt. By using state-of-the-art electronic leak detection technology; Our leak detection of pool water leaks has taken a quantum leap ahead of traditional, time-consuming methods such as water dyes, divers and air pressure tests. We can pick up pool leak sounds using submersible waterproof microphones. All pool water leaks produce an underwater sound signature which we can find & monitor with our headphones. Once Leak is found, a full report is given to the homeowner or commercial property prior to chopping up a deck or cutting of any pipe. Aquatic Pool Management may be able to come up with a cost effective way to repair the leaks with major demolishing of pool decks or walls.